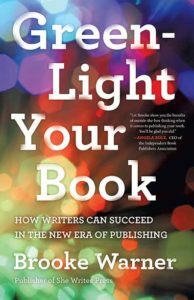 I am excited to announce the launch of Write Your Book in Six Months, an exclusive author mentorship program with myself and Linda Joy Myers, President of the National Association of Memoir Writers. Write Your Book in Six Months starts at the end of June, but as a benefit to our readers, followers, and students—and for my own accountability since I announced last year that I would write a book in 2012—I am announcing today that I am committing to writing my own book before the course starts. That gives me exactly 5 months to write my book. Fear that I’m taking on more than I can handle? Very high!!! Watch my launch video and check my YouTube channel to see my progress. Thanks everyone, and wish me luck! Excellent! Love this! I have no doubt you can do this, Brooke–and it will be great! One question: why have you decided to publish the book yourself? Thanks for asking, Bella! I want to get my book out as soon as possible and I’m mostly interested in selling to my clients and people who are interested in what I’m doing. In this case I think my own promotional efforts will go as far as a publisher’s—and I’m principally interested in building my platform. Once I have a larger platform—more readers, more presence, more everything—I’ll probably consider shopping a book to a traditional publisher. For now, I’ve already hired an amazing designer to do my book jacket, which I’ll share more about as I go. Very excited, actually, to not be dealing with a publisher on this particular project. You’re one gutsy woman, putting yourself, sweet James and your kitchen table on UTube! If I was a betting woman, which I am, my money is on you to make it to the finish line. 10,000 words a month. Now that’s a goal. I’ll be watching and cheering from the sidelines. Thanks, Christie! I need all the cheering I can get. Today, February 1, is day one of completing my first 500 words.